40 children’s portraits in 4 hours! At first it sounded impossible, but in fact it was lots of fun and the children were great. I want to take this opportunity to thank the lovely team at Play-school in Hartfield for asking me to pay them a visit and take portraits of all their pupils in play. I visited the stunning play-school grounds over a couple of mornings, and had so much fun! It was a real insight as to how brilliant play-school is for our little ones and how wonderful the staff are there. I had half expected lots of “don’t hit him” and “give that back” from the teachers, but there was only one minor telling off on the second day, and hardly anything to write home about. All the children, were focused, happy and having a great time. The team of teachers there, also clearly loved their job and had as much fun as the children. I had previously thought it must be really difficult handling so many children, but they did it all in their stride! What really got my attention, was how different we all are from a very young age. Some liked their own company, others ran around as group non/stop. It was hilarious. Although I got lots of candid images of them as individuals playing on their own, or deep in thought, or at play with each other, I loved how after a while many off the children started to follow me round and “perform”, singing, posing, dressing up! I haven’t edited the pictures yet, but I’m really looking forward going through them again, I know I’m going to be laughing to myself a fair bit. Its going to be much harder than I thought to make a final selection. Playschool had previously gone with a more formal style of school portrait, with each child sat in a chair looking straight into the camera. This time, they decided to go for something more dynamic and images that resembled a typical day at play school doing what they loved best with the friends they love most. For data protection purposes I can’t show you any of the pictures from the day. 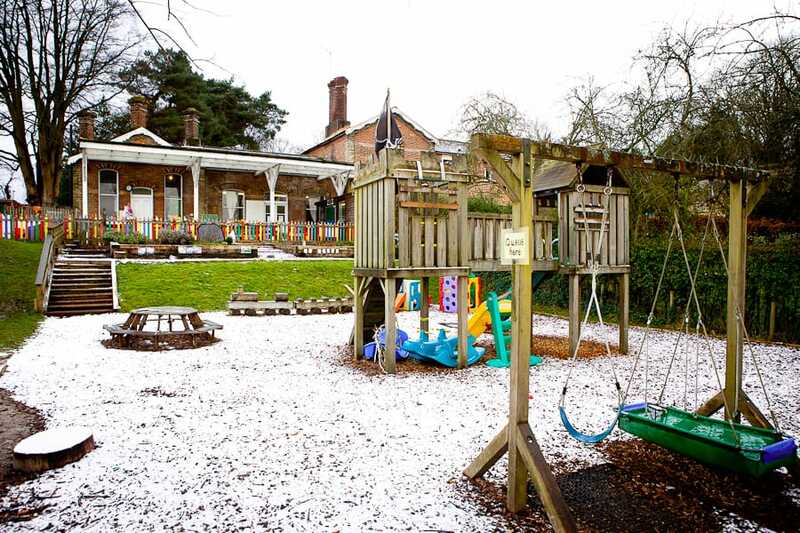 However I did want to share this idyllic location image of the playschool covered with a smattering of snow. The play school was once Hartfield Train Station, and the play school building is the old waiting rooms complete with platform! How cool is that! I can’t think of a better place for pre-schoolers to learn and grow. If you know of a nursery or play school that might appreciate a more dynamic style of photography, please do get in touch at mimi@mimivp.com or via the contact form.